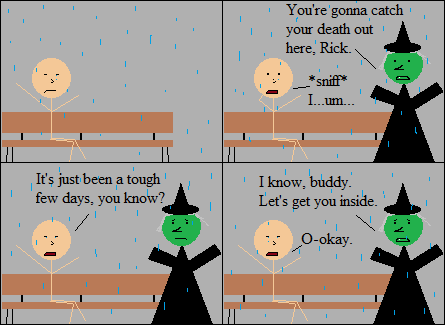 Inspired By True Events - I have no idea why Rick’s crying, but this comic makes me really sad. I have no idea why Rick’s crying, but this comic makes me really sad. This is the first time Baba’s been in the comic in two weeks, and I put her in the saddest thing I’ve ever done. For those of you wondering, no, I don’t hate my characters, despite evidence to the contrary. Also, don’t worry about me, imaginary readers. I actually had a nice day today. I mean, I cried while writing the comic, but the rest of my day was fine. It’s the 31st and I don’t have my calender up.